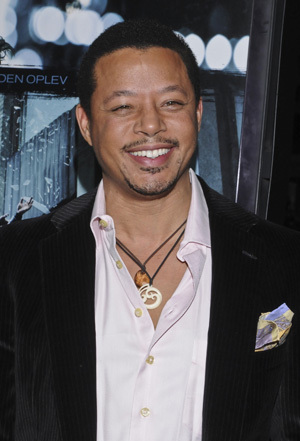 You kinda want to take a shower after hearing what actor Terrence Howard thought about his love scenes with Oprah in The Butler, filmmaker Lee Daniels’ historical movie about a longtime White House butler. Oprah plays the wife of Cecil Gaines, modeled on a real-life African American butler who worked in the White House under eight different presidential terms during his 30-plus years of service. Howard plays Oprah’s neighbor, and apparently gets it on with her: In October, Oprah tweeted a picture of herself in a vintage Kennedy-era costume smoking a cigarette while Howard seductively rubbed her knee. “And THAT’s a Wrap! Terrance Howard and me in our goodbye ‘love scene’. Thanks Lee Daniels for the great expe” tweeted Oprah along with the pic. Howard had only good things to say about Oprah, and um, her body, when asked about his love scenes with her by Movie Fanatic: “To be able to make out with Oprah and to have love scenes with her and those tig ol’ bitties… She’s such a lovely, voluptuous woman. She’s very very very beautiful and that was wonderful, that was wonderful.” All the while his hands curve around his chest, hinting at large breasts. Oprah herself has been talky about the movie’s love scenes, particularly in an interview with CBS This Morning, with Official Best Friend Gayle King in which she praised the makeout skills of Forest Whitaker, who plays her husband in The Butler. “Forest is a good kisser, how about that?” said Oprah. “Thank you, Keisha Whitaker,” she said, giving a shout-out to Whitaker’s wife. The Butler’s star-studded cast includes roles for Jane Fonda (who plays Nancy Reagan) and Alan Rickman (Ronald Reagan). James Marsden is JFK; perhaps most interestingly, John Cusack is Richard Nixon. Do you suppose they’ll stick a huge prosthetic honker on him? Oprah hasn’t appeared in a film since 1998’s Beloved. She’s been getting more press for her explosive interviews than movie roles of late. Are you looking forward to seeing this cast in period drag?